Denrele Edun, TV presenter and Boy George wannabe, could have taken it for a joke if anyone had told him that he would be bounced at a show in Nigeria. But that was what happened at a musical show organised by a multinational company in Lagos last Saturday. Looking weired as ever with his wild hair blazing purple, Denrele, as we learnt, had a pass for the main show. It was alleged that the presenter was having fun interviewing guests who came for the show at the main field. 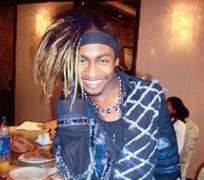 But as hyperactive and zealous as he is known to be, Denrele, who knows his onions when it comes to Video Jockey and has made a name for himself interviewing stars and celebrities, decided to go back stage to see if he could add some of the foreign artistes who were there to perform that night to his list of respondents. That, however became his undoing. It was alleged that the mean looking guards who were manning the main gate practically threw him out. http://nollywoodgists.com gathered that Denrele couldn't bear the humiliation, so he left the show blowing hot.